Queen Elizabeth II is the longest-reigning British monarch in history. She is the queen of 16 of the 53 member states in the Commonwealth of Nations. Born as Princess Elizabeth Alexandra Mary, her coronation was held on June 2, 1953. 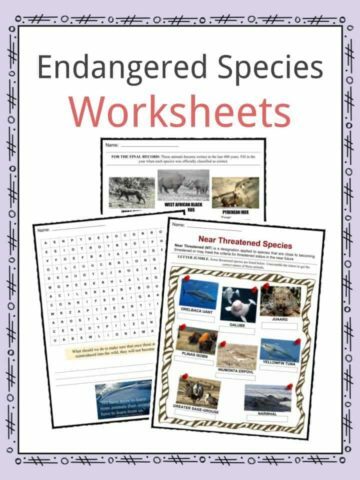 See the fact file below for more information on the Queen Elizabeth II or alternatively, you can download our 22-page Queen Elizabeth II worksheet pack to utilise within the classroom or home environment. Princess Elizabeth was born on April 21, 1926, in London, England to Prince Albert, Duke of York, and Elizabeth Bowes-Lyon. 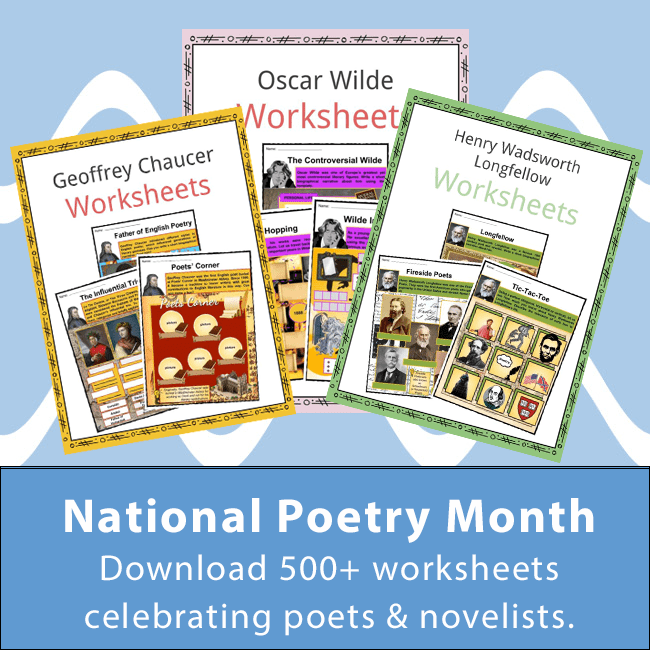 Her father who later became King George VI was the second son King George V and Queen Mary. 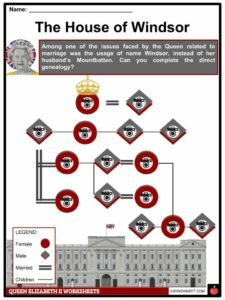 Her ancestors include Queen Victoria, the second longest-ruling monarch in British history, and King George III. 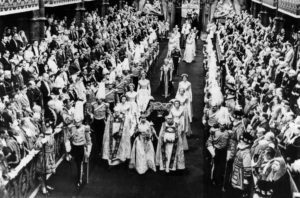 In 1936, Elizabeth’s uncle King Edward VIII abdicated the throne and chose to marry the American divorcee, Wallis Simpson. The following year, her father became king. Young Lilibet (as she was called) grew up in the Royal Lodge with her sister Margaret. 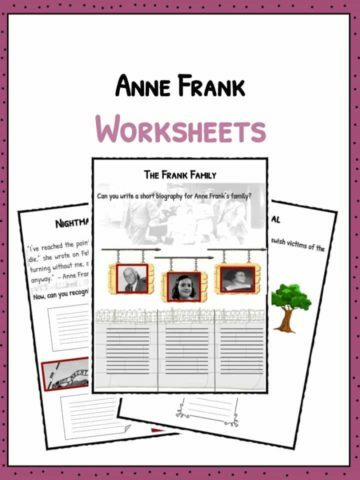 The siblings were homeschooled with courses including French, mathematics, history, art, dance, and singing lessons. When World War II broke out in 1939, the royal family was relocated to the Windsor Castle. She began to address the children of London through radio broadcasts assuring them that everything will end well. By 1942, she began to accompany her parents in royal duties, including inspections of troops, and official visits within Britain. On November 20, 1947, Elizabeth married the son of Prince Andrew of Greece, Philip Mountbatten. The Queen adopted the name Windsor as proposed by the Queen Mother and Prime Minister Winston Churchill. In 1948, she gave birth to Prince Charles, followed by Anne, Andrew, and Edward born in 1950, 1960, and 1964 respectively. By 1969, the Queen granted Prince Charles the title of Prince of Wales which made him the successor. 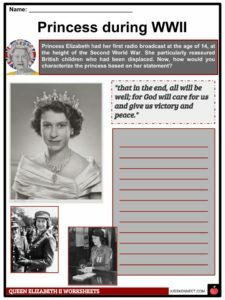 On June 2, 1953, Queen Elizabeth II officially became Britain’s ruling monarch after the death of her father, King George VI, on February 26, 1952. 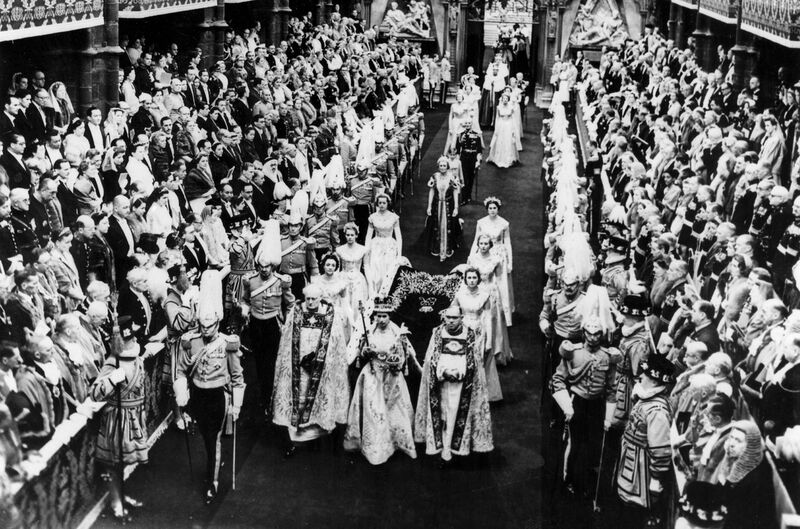 The coronation was held in Westminster Abbey and was the first to be broadcast on television. 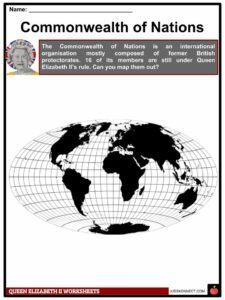 At the beginning of Queen Elizabeth II’s reign, Britain still had dominions and dependencies which eventually gained independence and became members of the Commonwealth of Nations. In the 1970s and 1980s, the queen travelled for official visits. In 1976, she went to the United States for the 200th anniversary celebration of American independence from Britain. In the same year, she opened the Summer Olympics held in Montreal, Canada. In 1979, she toured Middle Eastern countries including Kuwait, Bahrain, Saudi Arabia, Qatar, UAE, and Oman. In 2011, Queen Elizabeth became the first monarch to visit Ireland since 1911, which reinforced the crown’s symbolic power. As Queen, she cut back Royal family spending which was a 250 year tradition. Moreover, she continued to support numerous charitable institutions and programs. 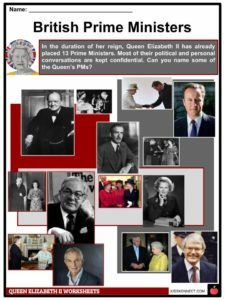 As of 2017, Queen Elizabeth placed 13 prime ministers, including Winston Churchill, Harold Wilson, James Callaghan, Margaret Thatcher, Tony Blair, David Cameron, and Theresa May. She has also met a quarter of all American presidents. In 1981, Queen Elizabeth faced a threat while riding in the Trooping of Colour in celebration of her birthday, when a man pointed and fired a gun at her. 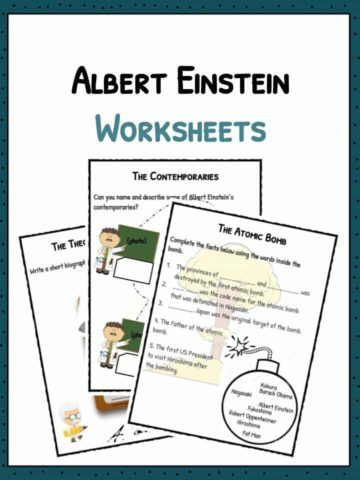 Luckily, the gun was loaded with blank bullets. Among other controversies which challenged the royal family was the failure of Prince Charles and Princess Diana’s marriage. The couple divorced in 1992, and Princess Diana died in Paris on August 31, 1996. The Queen was scrutinized by the media for being silent for days while the whole world was mourning. Some speculated that Queen Elizabeth did not want to grant Princess Diana a royal funeral which fueled public sentiment. A week after Princess Diana’s death, the Queen released her official statement. In 2002, Queen Elizabeth celebrated her Golden Jubilee. Sadly it was the same year she lost her mother and sister. 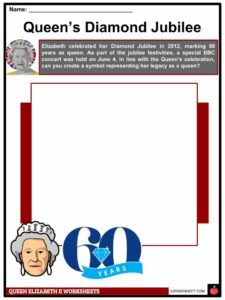 In 2012, the Diamond Jubilee marked Elizabeth’s 60 years as queen and in 2017, she celebrated her Sapphire Jubilee surpassing her great-great grandmother Queen Victoria who reigned for 63 years. In 2006, actress Helen Mirren played the role of Queen Elizabeth II in the film The Queen. She was awarded with a Golden Globe and an Oscar. In addition, Mirren also played the queen in a West End and broadway play The Audience, where she received a Tony Award. In 2016, Claire Foy portrayed the queen in the Netflix original series entitled The Crown, where she received a Best Actress Golden Globe. Prince Charles and Princess Diana had two sons; Prince William, who was given the title Duke of Cambridge, and successor to the throne, and Prince Harry. Prince William married Kate Middleton, Duchess of Cambridge in 2011. The couple had their first born, George Alexander Louis on July 22, 2013. Princess Charlotte followed in 2015 and their third child, Louis, in 2018. Aside from Prince William and Harry, Queen Elizabeth’s grandchildren include Peter Phillips, Princesses Beatrice and Eugenie of York, Zara Tindall, Lady Louise Windsor, and James, Viscount Severn. The Queen’s favorite dog is a corgi. She even created a new breed of dog, the dorgi, which is a combination of a corgi and dachshund, Princess Margaret’s dog. 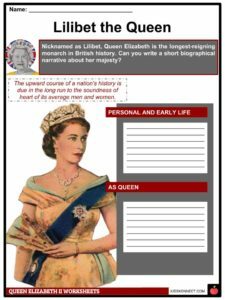 This is a fantastic bundle which includes everything you need to know about Queen Elizabeth II across 22 in-depth pages. 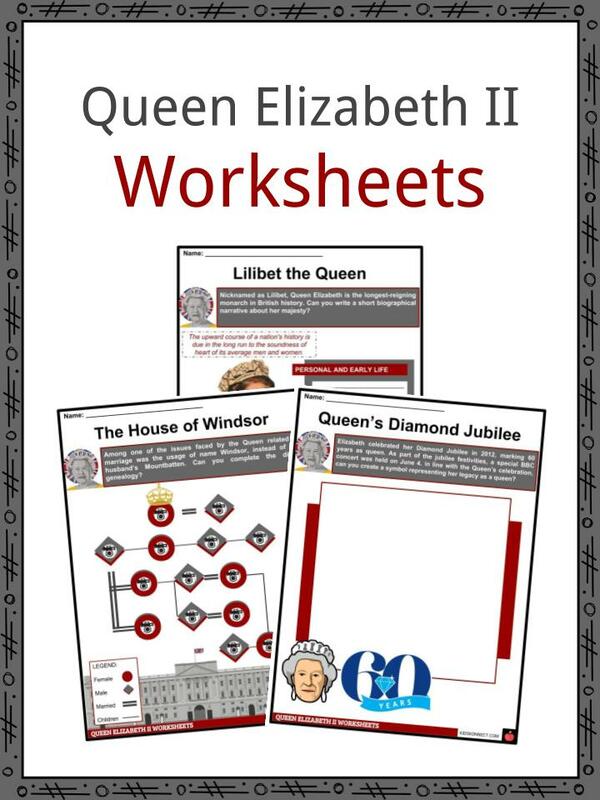 These are ready-to-use Queen Elizabeth II worksheets that are perfect for teaching students about Queen Elizabeth II who is the longest-reigning British monarch in history. She is the queen of 16 of the 53 member states in the Commonwealth of Nations. Born as Princess Elizabeth Alexandra Mary, her coronation was held on June 2, 1953.